We're suckers for a good piece of toast, and this concept design would be able to make every piece of toast perfect. 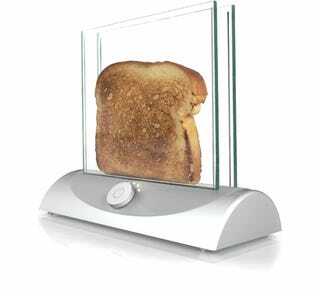 It uses heated glass to toast bread to perfection. Inventables, the design company behind this masterpiece, says that currently the glass doesn't get hot enough to toast bread, but maybe in the future. The only flaw seems to be the size. One piece of toast? Nobody eats just one. At least two pieces are required for ultimate toasty goodness.